Notwithstanding the ongoing profound changes characterizing today’s modern economies manufacturing remains a key vital component. Thus gauging the traditional inputs into that segment of the economy still provides valuable information regarding current and future economic activity. 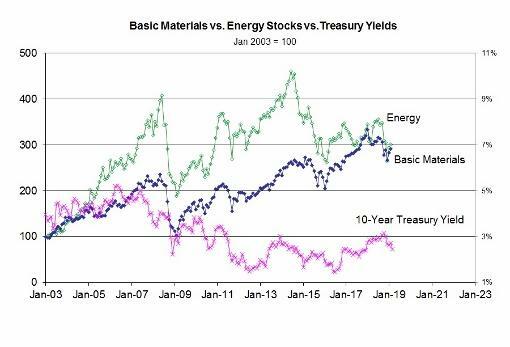 Not surprisingly, therefore, weaknesses in Energy (e.g., Exxon and Chevron) and Basic Materials (e.g., DuPont and Alcoa) stocks over the last year remain good leading indicators for a slowing global economy and the direction of longer-term interest rates, as captured by 10-year Treasury yields. Look for additional weakness in the Energy and Basic Materials sectors to confirm the headwinds slowing the global economy – implying a further and steeper drop in Treasury yields.